Based on requests from visitors, I have decided to compile my own guide to taking advantage of the credit card companies' 0% Balance Transfer Offers. I hope this guide will help everyone understand how to maximize the value of these offers and help boost your earnings for the year. If anyone has additional suggestions or tips - please post them in the comments. What is a 0% Balance Transfer offer? Most of us frequently get these annoying solicitation from credit card companies trying to get me to sign up for their credit card. Infact there are probably some in the advertising on this web site right now. Most of these offers include some gimmick or promotion to entice you to sign up for these offers. A typical offer I see is "0% APR on Balance Transfers until 2007!" where the date given is typically 8-12 months in the future. Also, keep in mind the longer the balance transfer offer lasts the more you can make. I typically wait until I receive an offer that is at least 0% APR for 12 months. This is a 0% Balance Transfer offer - read on to find out how you can take advantage of them. How do you screen out the less attractive offers? Once you have a 0% Balance Transfer credit card offer, you need to review the fine print to make sure there are not any catches with the offer. The biggest catch out there in a small "balance transfer fee" typically 3% (but varies with each credit card company). You want to make sure there are no balance transfer fees other fees associated with taking out a balance transfer. (Note: You can still profit if some of these fees are in the offer, but since these offers are frequent, I would just recommend waiting for a better offer). Here is an example of the fine print on balance transfer fees. Notice this offer has a balance transfer fee of 3% ($5 minimum, $75 maximum). I prefer offers with no balance transfer fees at all, however if you can't find a no fee offer, one with a maximum may also work ok for you (just $75 less profitable in this example). Now that I have an offer, how do I get access to this 0% balance transfer? B) Apply the balance to other credit cards. ->B1) If you have a soon to be expiring 0% balance transfer then just ask that the balance transfer be used to pay off the balance on the old account. ->B2) Depending on how much you purchase every month on your credit cards, ask that the balance transfer be applied to you primary credit card to pay off your existing balance and any credit on you primary credit card account you can consume in future purchases. Instead of paying the balance on your primary credit card you spent, earmark those funds as your balance transfer funds. C) If you have a HELOC have the balance transfer applied to this loan. Then you can write a check to yourself for the amount transferred. D) If you have any type of loan, consider having the transfer amount paid to that loan. If you are planning on paying down/off the loan in the near future anyway you may be able to make a better rate of return by using the balance transfer to pay it off sooner rather than later. I have used techniques A, B1, B2, and C all with great success to get access to the balance transfer loan. Now that I have the 0% balance transfer, what do I do with it? The whole reason you are doing this is to earn money, so this is a very important step. I always look for the highest-yielding risk free investment. A) Online high yield savings accounts such as HSBC Direct, ING Direct, or EmigrantDirect. B) If you have an outstanding balance on a HELOC or Line of Credit and you can pull back out money at anytime, consider paying down the HELOC or Line of Credit. You may make a better return on your money by saving on the interest payments. C) Short term treasury bills on TreasuryDirect.gov. D) Short term CDs such as a 6-month CD. I have been putting my balance transfers in my EmigrantDirect and HELOC accounts. How do I pay the balance transfer back? Every month you should make the minimum payment on this credit card with the balance transfer. The minimum is usually somewhere around 2% of the balance. On a $10,000 balance transfer we are talking about a payment around $200 a month. I usually move the minimum payment amount from my savings account and try to pay the minimum payment as soon as I get the statement to avoid any risk of being late on my payment. To date, I have never been late with one of these payments. I usually plan on paying back the entire balance of the balance transfer the month before the 0% APR expires. So if the offer expires in June 2006, I would pay the loan off in May to ensure I don't risk accumulating any interest on the loan. You can read the fine print of the credit card offer to determine exactly when the 0% APR expires and when the credit card company begins charging interest. Taking advantage of these offers does lower your credit score. Its hard to tell how much, but I was surprised last year when my credit score fell significantly most likely due to taking advantage of several 0% offers. I currently have 2 0% balance transfer offers and my credit score appears to have recovered. -Using balance transfers can help increase your liquidity. Having this "extra" cash in savings accounts with easy access to them, allows me to take my "emergency funds" and other short term savings and put them to work in more restrictive, but better return vehicles, like 1 yr bonds, or paying down some of my mortgage. -Taking advantage of balance transfer offers can result in pretty significant returns. Last year I probably earned close to $700 in interest from money borrowed using 0% balance transfer offers. -You typically cannot do a balance transfer from one credit card to another credit card offered by the same company. -Read and re-read the fine print on the credit card. If you have questions call the credit card company and make sure they explain the fees to you. Thanks for posting the details of your technique.I've always been tempted, but I'm not sure I have the "nads" to do it.Perhaps the next card offer I get in the mail I'll check it out. 2mill,I plan on doing this in the near future after improving my credit score a little bit. I'm waiting for some things to fall off from the previous year as well as paying down my current 0% offer so that my utilization rate is lower. I've posted about exactly how much money you'd make with such an offer: 1st post and follow-up.As I've noted in my second post, minimums are increasing to 4% and ED has increased their APY to 4.25%. If I transfer the money from ED directly to the CC every month, then I stand to make 3.32% APY.Thanks for the post, very informative as usual. I've been following this topic pretty closely for some time now. Spent a lot of time on Fatwallet also. I started the process this week with interesting results. With a shotgun approach with apps this is what has transpired.Citi Platinum Select - $3000Citi Simplicity Rewards - Declined due to to many aps in 6 monthsGM (HSBC) - Approved initially for $1500, asked to do a significant BT and got it bumped to $7000Chase Cash Plus Rewards - $5000Citi Professional - $6000USAA - $25,000.I wonder what USAA was looking at. Now it's time to fix the credit.However, I've already hit my first hurtle. I applied for the highly recommended GM Card from HSBC. Initially, I was approved for $1,500. Not off to a great start. I called and explained that I wanted to do a balance transfer and picked an arbitrary number of $7,000. Underwriting approved it provided I tell them which cards to send the checks to. So, I actually have a balance of $3,500 on an MBNA and $1,200 on an AMEX. I asked they send $4,000 to MBNA and $2,000 to AMEX. I was planning to pay off the balances from savings anyways. But I'm going to request MBNA and AMEX cut me a check for the overpayment. Putting all monies towards paying off the balances, then transfering the $6,800 into an equivalent ING acct.I'm curious as to how other people would play out this situation. What do you recommend? You also made a comment about paying off a HELOC. Have you factored in the "tax deduction" effect? How does the math play out on paying it off (or down) in addition to savings on payments, and interest deductions?Thanks for your blog, huge help. Ryan,I think I would try the same thing in regards to the GM balance transfer.As far as the HELOC its actually (for me at least) comparable to putting the money in a savings account. For example say my fed/state inc tax rate is 33% and the HELOC and savings account were charging/paying the same rate.With the HELOC I am losing a tax deduction of roughly 33% if I pay it off, but if I stuck the money in a savings account like EmigrantDriect, the interest I earned would be taxed at 33% so the after-tax rates in both cases would be the same. Does anyone know how easy it is to significantly increase your credit limit on new cards? I just got my first 0% card for the purposes of this exercise and was given a $6800 limit (I stated my household income as 85G). When I activated the card I requested an increased limit to 10G which was granted within an hour. Obviously the best way to take full advantage is to get as much money from each card, so I'm wondering if it's just a simple matter of requesting a higher credit limit after you get the card. As hungry as these CC companies are to give out balance transfers it seems like they would be willing to bump your limit 50% without problems. Anyone bump their limits as a matter of course? Have you ever tried making a balance transfer to your debit card? That seems like it would be an easy way of making a transfer. I am thinking of trying that.Thoughts? For the little money you are making do you really think it is worth the cost of ruining your credit? I konw this would have to affect your credit somehow. Am I wrong? 0% transfers are great! I do them about once every 2 years, and my credit score is well in the 750-800 range. One word of warning, like 2million said read and re-read the fine print! Read the big print too and keep the offers handy in case you ever need to refer back to them.There are also 0% on NEW purchase offers, 0% on balance transfers, and 0% on both. Be wary!I always just transfer over how much I have on my statement and then request a check. It's a great cash advance that doesn't get treated like a cash advance. I've noticed that my cards have all eliminated the max limit on cash advances recently, though the % still is 3%. This makes it more expensive to take out big cash advances and needs to be taken into consideration. This whole discussion is interesting but consider the following:The risk of getting 'caught' unaware by the fine print on one of the credit card agreements, the lowering of your credit score due to opening up unsecured lines of credit (chasing these 0% deals), and the general behavior of living outside of your means (carrying around balances on credit cards in the first place) are worth examining.For example, you transfer a balance to a 0% offer, it lowers your credit score, simply in the applying for a new card. You now go to borrow money for legit purposes (home, student loan), and due to your lower credit score, you are not given the best rates on 'real' debt. This debt is secured and typically longer in term. Where is the interest 'savings' now?My advice is to spend the same amount of energy on adjusting your spending habits that you do on chasing the credit card deals. The 0% offers are the needles, and our overall culture of consumption as a lifestyle is the drug. Thanks for the post. I am currently planning on taking advantage of a similar offer on a credit card that I recently paid off with a credit limit of $23,700. With ING's promotional interest rates of 4.75% this is a great time to save money in those account. I've used these balance transfers before and they will gladly wire them directly into your checking accout, which I find easier and quicker than having to write a check to myself. personnally, I prefer the fixed 1.9% "until paid off" offers better. You can take a decade (or more) to pay it back. personnally, I prefer the fixed 1.9% "until paid off" offers better. You can take a decade (or more) to pay it back.The below story is based on personal experience with a Chase Visa card and which I have published elsewhere on a few forums in the past. It applies to this discussion if you take these loans to deposit elsewhere and still make charges on the same credit card. --------------------------------------------------------------------------Ever wonder why credit card companies constantly pitch you to consolidate your bills, take a vacation, improve the house, etc. using a cash advance loan at low teaser interest rates? 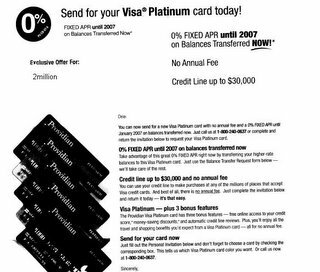 There's a scam behind any offer you get from a credit card company, so beware. They aren't in the business of losing money.These cash advance loans are always touted with low interest rates for some period of time (3.99%, 1.99% or even zero percent). Now, if you pay off all your charges on this account before you take out this loan and DON'T charge anything new until the cash advance loan is paid off, then you will be okay. But of course, most people don't do this. And this is critical: what you may have missed buried in the fine print that I've seen with many credit cards is that if you have an outstanding balance when the cash advance is posted to your account or you make any new charges (in addition to this new loan amount), the payments that you subsequently make against the total owed will be FIRST allocated to the portion of your balance with the LOWEST interest rate.Let's assume you regularly charge $400 monthly on this card and always pay the balance off with each monthly bill. So you never pay any interest to the credit card company. The credit card company is not happy about this, so they bombard you with checks with low interest rates for cash advance loans, hoping to entice you into a consolidation cash advance. Now, due to some unplanned expense, you find you have to take a cash advance of $3200, perhaps offered at some very low annual interest rate (plus transaction fee), to cover that unexpected expense. And let's assume that you'll also keep charging your normal $400 monthly on this SAME card. You'll now need to pay off $3200 extra (in addition to the regular $400 monthly) and you realize this will take you some months to do. Your intention is to keep making your regular payments to pay off your usual monthly bill and add something extra to pay down the cash advance loan over time. You don't think this will be too bad because, after all, you will only be paying 2% interest on the declining balance for the $3200 loan. So you increase your payments to $800 to cover the usual $400 monthly charges and then have the extra $400 applied to reducing the cash advance loan. Right? Wrong!What the credit card company will do is allocate your full $800 payment towards the $3200 cash advance portion first because that portion of your balance has the lowest interest rate. Meanwhile they will charge you full interest (18% or whatever) on the $400 you charge each month (which becomes a growing balance continually exposed to the normal higher interest rates because it is not being paid down). Result: You will pay a lot more interest than you thought by adding the loan at 2% interest and continuing to use the credit card.While this method of allocating payments might seem logically backward to the consumer, it's a system that is very advantageous to the credit card company. Many people get drawn into deals like this and don't realize it until later on, if at all. And unless the government gets involved to protect the consumer from shenanigans like this, it isn't going to change anytime soon. Very good stuff. As long as you are not applying for big credit in the near future, then it is alright.Also, instead of opening up new CC, you can always just use the offers you get from your current cards, assuming that you have a zero balance. Is there any way to get the CC company let you know your credit limit before filling in the application with the pre-approved offer? I tryed several times. No result.Thanks! I don't know why these credit card companies don't simply give us the interest we earn from their offer. Instead we have to go through this hassle of applying the damn credit card and put that money into a high yield savings account. Or is it because they have a math department on their side that have calculated the odds would be on their side that we would mess up with the new balance?Now that I think about this. It would seem pretty scary if someone got your personal information and use it to make these balance transfer. I wonder if there's a way to prevent someone from opening up new credit cards using your personal information? Yes I have heard of a service that locks your credit and only lets credit accounts be openend on your credit when you authorize them - or something like that. When you pay (ex.1.9%) for a BT your ultimate profit is reduced further because you are paying with after-tax money. I fully endorse the BT strategies though, and have been utilizing this process since the early 90s when banks would actually pay you up to 2% to use their money interest-free. At that time I maximized the system by completely paying off my fully mortgaged (9%) home in 5 years.I currently have 9 BT offers and 1 HELOC (1.25%) totalling 250k in HSBC making 4.8%.Just wanted to say that the system is definately not for everyone, but if you don't mind reading fine print and paying bills, it does work. Wow - $250k in oustanding BTs? Do you find it hurts your credit score significantly with so much outstanding?Any additional suggestions to share? Actually 100k is on the HELOC. I really do not keep a close eye on my credit score; it was 756 about 6 months ago. As far as the BT's, I have 16 credit cards and if I don't receive an offer in the mail, I don't hesitate to call and ask. I try to get BT's or promotional cash advances directly deposited to my HSBC account. I use Quicken to help keep track of deadline payments. The best savings came about 3 years ago when I purchased another house with 8 credit card balances, all less than 5%. The savings came from not having to pay mortgage closing costs. After the house closing I immediately applied for a promotional HELOC with no closing costs.One thing to watch-out for:My first promo % HELOC ran out so I paid the loan off and didn't realize I owed $100 for "no balance".OUCH! !I need to invest in a nice magnifying glass. Dangerous, dangerous, dangerous. Ever hear of universal default? I am dumbfounded at the amount of risk you are taking for a one-year profit of $700. I've been doing the zbt's and other credit card games for over 12 years. I've never paid interest and never will. About 6 years ago I signed up for a GM Card that earns 5% with no limit on how much you can accumulated (earn) in one year, the only limit is on redemptions for what kind of vehicle you buy. I earn 5% toward a new vehicle when I charge on the GM card and then transfer the balance onto a 0% card. One other thing I do is pay the zero balance card on the payment due date and pay it off on the day the 0% ends, all electronically. Basically, I keep my money longer. I call the credit card company and ask what that final date is to be sure. Keep good notes and records. Everything talked about above I've known for years and it does work. I’m in the very early stages of attempting a BT out of Chase but I actually will be making a purchase @ 0% APR to initially fund an online High Interest CU account (www.rateedge.com (they actually let you charge your initial funding)), so I’ll get both interest at 5.5% (until I move the Balance to my FNBO account) as well as ~24,000 reward points. My main question is can balance limits from Business cards be moved to consumer cards within the same card family? There has been alot of new activity in my Credit reports within the last two months 2 chase cards were opened, 1 ATT/citicard was opened and 2 Online High Yield Accounts were opened (FNBO & AmTrust). Additionally Chase closed a linked Pier 1 card due to no activity and denied me a credit limit increase on an older Chase card I had. I want to apply for another citi card that is business related mostly for the instant rewards and then move it’s limits to the ATT/Citi card which is 0% BT that starts anytime within the initial 12 month into period. Should I apply for the Citi Business card or wait till there is less activity in the account. I don’t really want to apply once they can see that I’ll have ~24,000 $ of revolving debt (of course simply sitting earning interest) due to the "purchase" at rateedge.com. Advice is needed. Have you ever tried making a balance transfer to your debit card? How does this work using your HELOC to save money on your mortgage? I'm curious to know, since we've mastered the high-yield savings float. Its simple. If you have a HELOC you can pay it down/off with a 0% balance transfer. When the 0% BT expires, you can pay it off with the HELOC. This allows you to carry a portion or all of the HELOC at 0% instead the variable interest rate (ex ~7%). Regarding doing the transfer from a credit card with no balance, 2million's note that some friends have warned that some banks won't send a check for an account credit has me a bit worried since the credit card that I would use if not trying the Paypal card would be one for which I've never tried this (Wash. Mutual). I have to wonder how any bank could not pay off a significant credit. How could it sit on, say, $10,000? Is one supposed to use that in credit card purchases for the next 10 years? It doesn't make sense. I think that, if nothing else, the bank could be compelled--via its own indendent arbitration process or by some government agency--to pay off the credit. I am new to this but wanted to spread a tid bit about how I charge up the 0% cc. The us mint (www.usmint.com) is selling the dollar coins at face value and they ship them to your house for free, you give them a dollar, they give you a dollar, the exchange happens on your zero percent card. I then put the money in my ING account. I have transfered 2500 thus far. I have two zero cc's with a 22,000 limit each. I am workking my way to maxing them out...slowely but surely. Thanks for all the info and warning, I do take heed to what was said and apply all of the precautions.